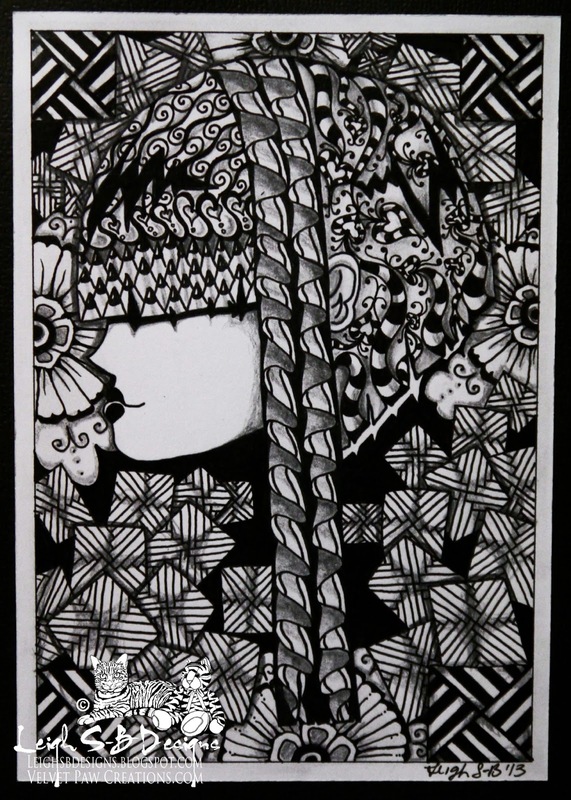 It's week 2 of the Smudgy Antics "Tic Tac Toe Challenge and yesterday I shared my first Zentangle creation, "The Girl with Daisies in her Hair", which is based on the three items I selected from the Tic Tac Toe grid: Paint, Doodles and Cardboard. 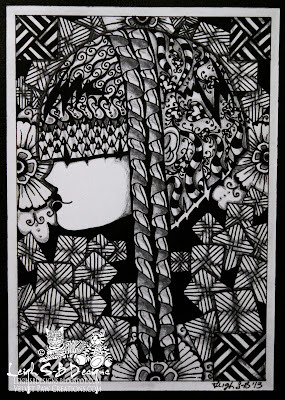 I got my Zentangle action on with two digi images from Smeared Ink's new Hidden set and today I'm sharing a more complex Zentangle creation titled "The Girl That's Hidden". 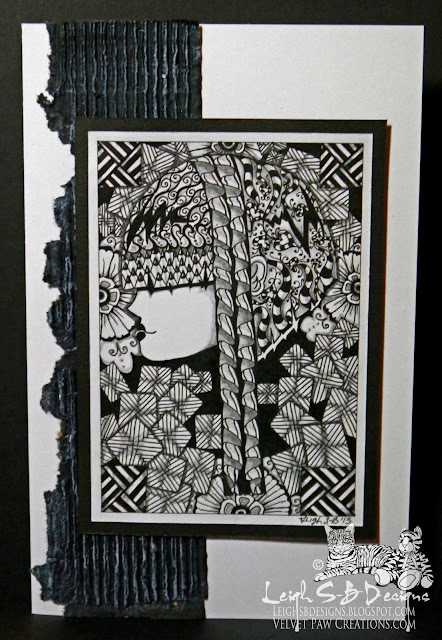 This one started out the same as my first piece where I added the black frame in Photoshop CS6 and printed the Smeared Ink image out onto white cardstock. For the 'doodles' part of the Tic Tac Toe challenge this time I decorated the entire image with the following Zentangle patterns. Her hair is a combination of Bannah, Stubs (the pencil tips), Bleeding Hearts, Btl Joos, Alice and Emilie. The background is a combination of Flora, Weave and variation of the Weave in all 4 corners. 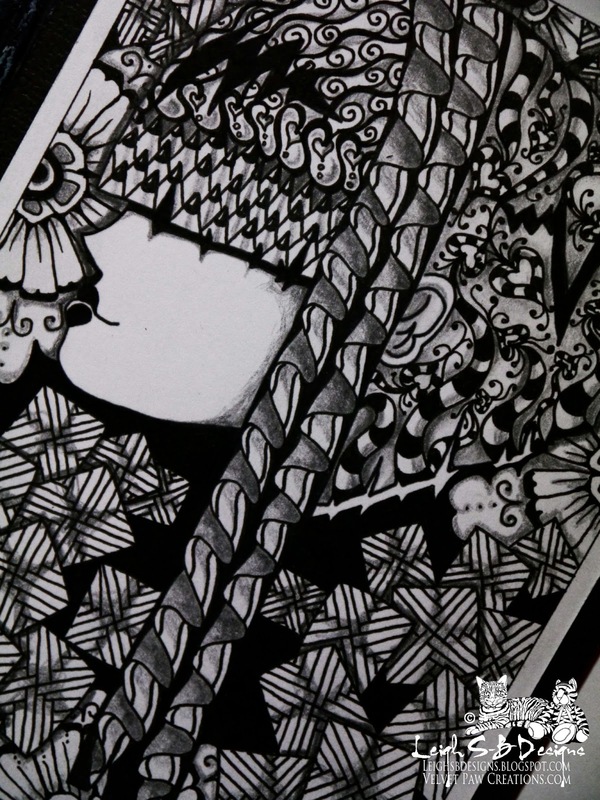 I used a combination of 01 - 05 black Micron pigment markers by Sakura and a pencil to add all the shading. Click on the photos for a closer look at all the details! 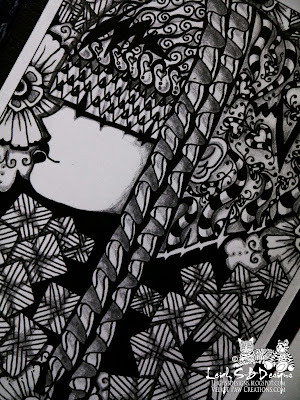 I have the Zentangle books available from Design Originals but you will also find a wealth of info if you Google the pattern names I used too. I used my Perfect Layers tool #1 to trim leaving a 1/8" border of white cardstock then adhered the panel to black cardstock with Scotch Quick Dry Adhesive. Then used Perfect Layers tool #2 to cut the black mat leaving a 3/16" border. 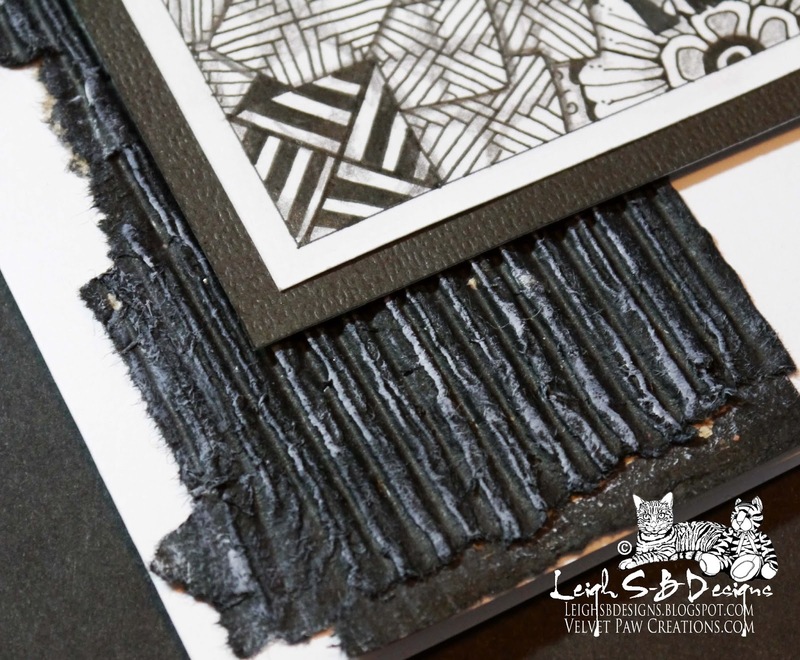 I'll be posting more about these fabulous tools this week but in the meanwhile you can use the links to check them out and don't forget to use my special coupon code Leigh5% to get 5% off your entire Perfect Paper Crafting order! For the 'cardboard' part of the challenge I tore a strip of corrugated cardboard and stained it black with Black Soot Distress Stain. Once the cardboard was dry I used my 3rd selection, paint, and dry brushed on white acrylic paint to highlight the corrugated ridges. I folded a sheet of white cardstock in half to form the card base and adhered the cardboard with Quick Dry Adhesive then adhered the main panel with Create & Craft 3D Silicone Glue.